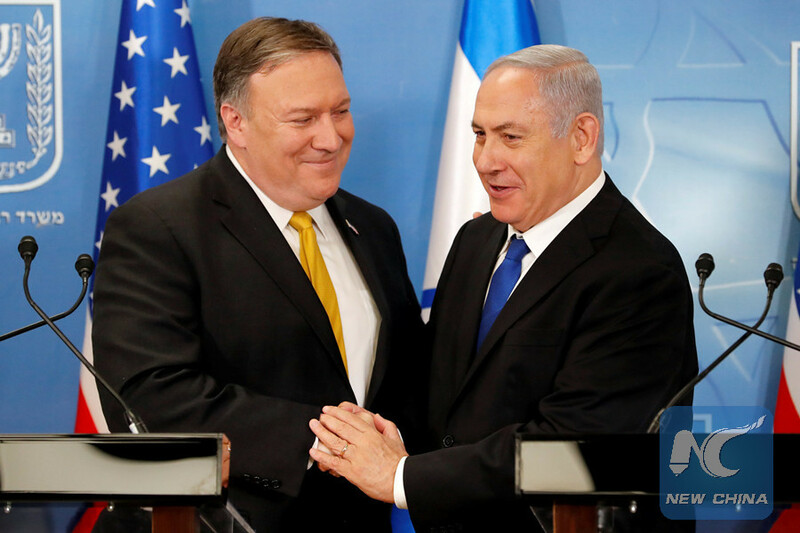 Spotlight: Netanyahu, Pompeo pledge to solidify Israel-U.S. alliance, counter "Iran's aggression"
JERUSALEM, April 29 (Xinhua) -- Israeli Prime Minister Benjamin Netanyahu and visiting U.S. Secretary of State Mike Pompeo held talks on Sunday, pledging to deepen the long-standing alliance and counter "Iran's aggression." The two met at the Israeli Defense Ministry in Tel Aviv, as part of the newly-appointed U.S. secretary of state's first official visit to Israel. Netanyahu congratulated Pompeo on taking office last week and thanked him for the visit. "I think it's symbolic of our friendship, which is deep and getting even deeper and stronger," Netanyahu said after the meeting. Pompeo echoed him by saying that the ties between Israel and the U.S. have "never been stronger." He said that his conversation with the hardline Israeli leader were focused on what he described as Iran's "destabilizing and malign activity throughout the Middle East, and indeed throughout the world." Pompeo said the U.S. remains "deeply concerned about Iran's dangerous escalation of threats to Israel and the region." He vowed that the "United States is with Israel in this fight, and we strongly support Israel's sovereign right to defend itself." His comments came after the Israeli air force allegedly carried out an airstrike early the month on an airbase in Syria, killing at least 14 people, some of them were Iranians. The attack came after Israel repeatedly warned it would not allow Iran to establish military bases in Syria. Iran has vowed revenge over the Israeli killing of its military advisers in Syria. Netanyahu said he appreciated the position of U.S. President Donald Trump's administration on "stopping Iran's aggression in the region." He blamed the U.S.-led nuclear deal with Iran, signed by Trump's predecessor Barack Obama, for causing Iran to increase "aggression" in the region. "If people thought that Iran's aggression would be moderated as a result of signing the deal, the opposite has happened, and Iran is trying to gobble up one country after the other," he said. Netanyahu, a staunch opponent of the 2015 landmark deal, told Pompeo that Iran must be stopped as well its quest for nuclear bombs. Referring to Trump's position on the deal, ahead of the May 12 deadline for extending the waiver on the nuclear-related sanctions on Iran, Pompeo said Trump has been pretty clear about the deal that its flaws should be fixed, or the U.S. will quit it. Though Trump has threatened to withdraw from the Iranian nuclear deal, European countries have been trying to salvage the deal by using others means to deal with Iran's missile projects and expansion of influence in the Middle East. Regarding Syria, Pompeo said the U.S. top priorities are to defeat the militant group Islamic State, deescalate violence, deter the use of chemical weapons, ensure safe delivery of humanitarian aid, and support a political resolution to the conflict. "Our strategy to do that remains unchanged," he said. "We strongly support the UN-led efforts in Geneva to bring an end to the Syrian conflict, which has gone on for far too long. We know there are many challenges ahead, and we look forward to being your partner in resolving each of them," he said. The two leaders also addressed the sensitive issue of Jerusalem, where the U.S. will relocate its embassy in Israel from Tel Aviv on May 14 in a controversial move. Netanyahu hailed Trump's recognition of Jerusalem as the capital of Israel in last December as a "historic decision." But the Palestinians have denounced the move, and rejected the U.S. as a major sponsor of the Israeli-Palestinian peace talks. The Palestinians have been hold protests against the U.S. move and clashed with Israeli forces along the border between Israel and Gaza Strip in the past weeks since later March. Pompeo said the administration is "incredibly proud to be opening the new embassy," adding the step comes as Israel celebrates the 70th anniversary of its establishment. However, he also stressed that Trump made it clear in last December that the boundaries of Israeli sovereignty in Jerusalem are subject to negotiations between the parties. He said the U.S. remains committed to achieving "a lasting and comprehensive peace that offers a brighter future for both Israel and the Palestinians." Israel seized east Jerusalem in the 1967 Middle East war, along with the rest of the West Bank and Gaza Strip. It annexed east Jerusalem shortly later, claiming it as part of its "indivisible capital," in a move which was never recognized internationally. The Palestinians have insisted that they will establish an independent Palestinian state with East Jerusalem as its capital. Pompeo arrived in Riyadh, Saudi Arabia On Saturday to start his first official trip outside the U.S. after being sworn-in last week. He will also visit Amman, Jordan, another ally of the U.S. in the region.